Our work is made possible by kind and compassionate supporters whose donations fund the nutritional, environmental, medical and enrichment programs that primates living in captivity require to thrive. Without generous donations, we simply could not provide the livelihood these animals deserve. In order to show our supporters just how important their generosity truly is, we invite all of our sanctuary members to come witness their gift of sanctuary ONE day every year at our Annual Member Event. 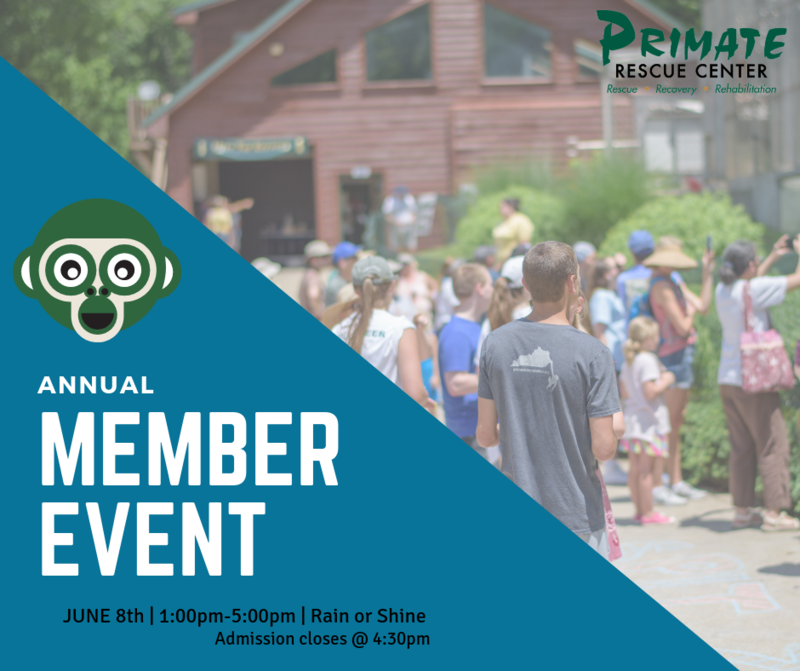 If you are a member of the Primate Rescue Center, you will have the opportunity to visit the sanctuary on June 8th. This day is one we look forward to all year, as it is the ONLY day that we have the opportunity to share with our members the amazing work they make possible! 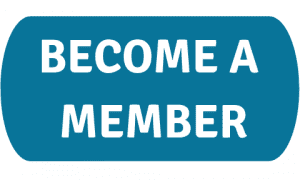 If you have been a member in previous years, be sure to renew your membership in order to receive an invitation to this year’s event. As always, members have the option of increasing their donation amount in order to bring guests along. At the event, members will enjoy a silent auction stocked with unique items, a raffle, a gift shop full of PRC merchandise, food trucks with delicious grub and much, much more! 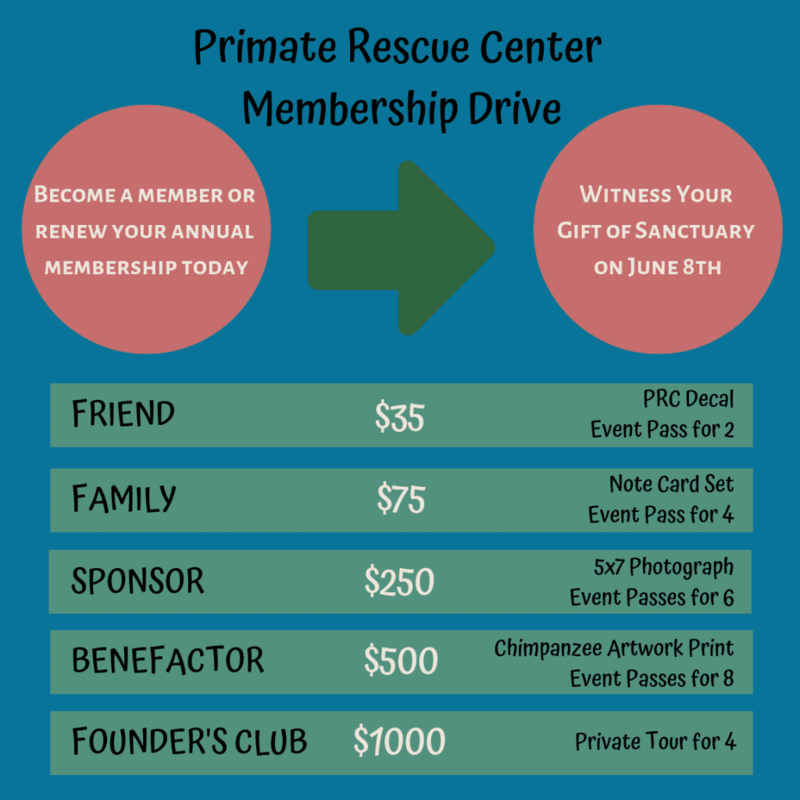 Most importantly, our members will witness the gift of sanctuary firsthand as they learn about the most important facet of our sanctuary – the primates! If you’d like to know more about what takes place at our Annual Member Event, take a look at this blog recapping last year’s event. Stay tuned for more details regarding Member Event such as the schedule and what items you can expect to find in our silent auction, gift shop and raffle! Please contact us if you have any questions or concerns.